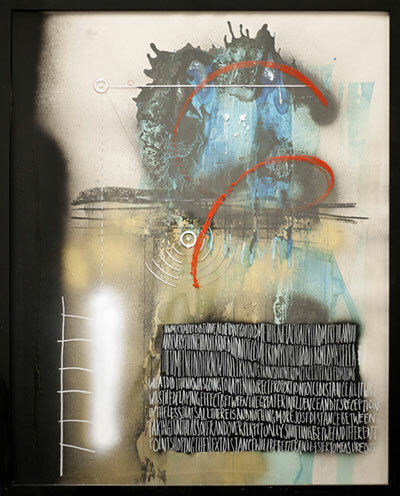 ALL IMAGES: Mark Johnson, Untitled, mixed media, 25” x 31” 2015. Co-Lab Project’s N Space recently broke its short sabbatical to open APOLOGYTOTIME by Mark Johnson (on view through June 24), a layered smorgasbord of two-dimensional visual delight. The curatorial committee, composed of Sean Gaulager, Chris Whiteburch and Austin Nelsen, have a specific vision for the work they present at N Space and Johnson’s body of work is a shining example of their ability to put together a show that is well edited, sharply attractive, and conceptually curious. 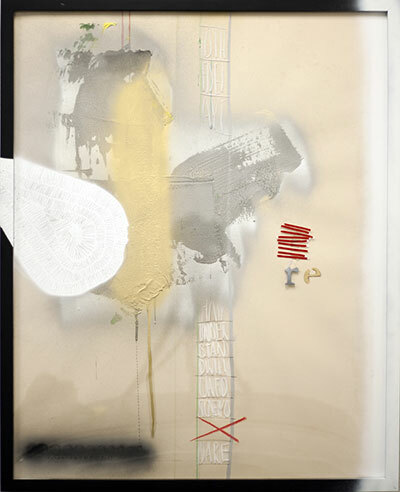 Johnson’s work has always seemed preoccupied with text, letters, and sculptural components, though it is clear he has the soul of a painter, and the works on view here are no different; twenty, twenty-five by thirty-one inch two dimensional wall objects make up the content of the show and each employs a wealth of materials and handwritten text which come together to create works that are tricky and wonderful to behold. 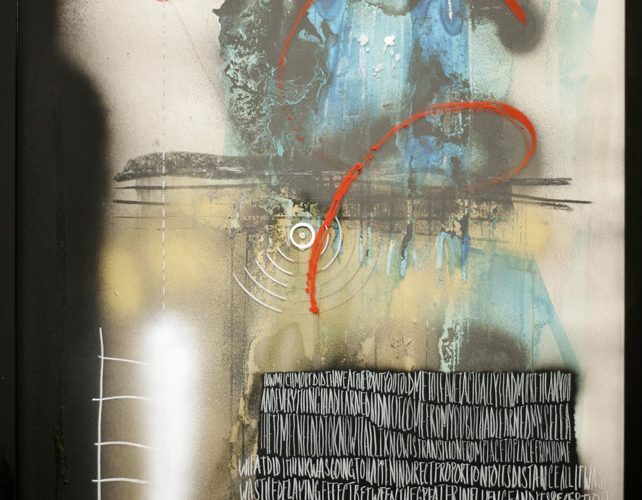 Technically Johnson works in “mixed media,” an annoying but fair description of his approach, utilizing numerous tools and media to drive a certain novelty. 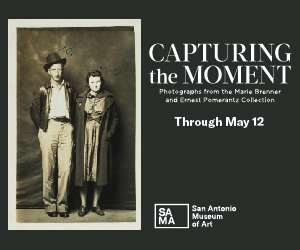 There is little in the way of clues about the works presented in APOLOGYTOTIME, except that contained within each are the hasty scrawls of a brain alive with overwhelming creative force. The formality of the work is perhaps the most interesting aspect of Johnson’s clearly half technical, half experimental execution, the works on view at N Space are not paintings or drawings but wall objects, and while they may sit behind glass, the layers of paint, graphite, appliqué tape, sculptural objects, and aerosol paint that flow in and out of the frame lend his pieces a mystical sculptural quality. 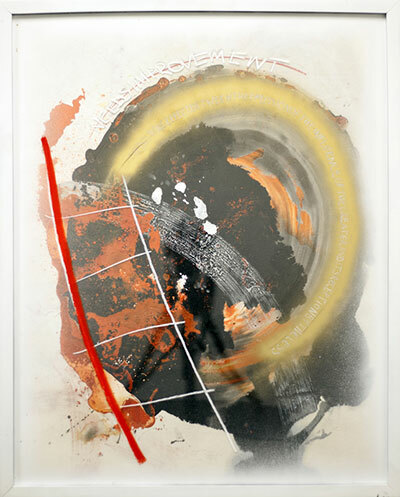 Each work contains similar but unique mark making and sculptural elements within, on top of, to the sides of, and completely outside of the layers of the framed pieces. One of the works actually has a wooden “e” lying on the ground in front of and below the painting. Nothing is off limits, Johnson exploits all the dimensional boundaries in a compelling free for all of material and radical gesture. The text that each piece contains is handwritten and clearly little more than a stream of consciousness—I wasn’t sure if I could, would, or even wanted to read what he maniacally scrawled into shapes on the surfaces but when I tried I found it frustrating to consider, which is probably the point. In spite of this, the written parts serve as an obvious but totally inaccessible legend to the work, like Alice in the anteroom, encountering the key to the door to Wonderland she is far to small to use. It’s automatic writing in the classical sense, a tool of self-hypnosis to access the written thoughts and speech of one’s subconscious, and in this vein, Johnson’s work feels full of the familiar and dense symbolism associated with that age-old creative tool. A motif of a ladder also appears again and again, further pushing me to consider a trip into the depths of the mind. The ladder is commonly used as a visual tool for inducing hypnosis, that is, moving down or up the ladder in one’s mind in order to descend deeply into the subconscious mind or return to the external reality. The hasty circles and diagonal lines appear like brilliant moments of realization, drifting through one’s mind these formal elements feel like lighted buoys in a deep and sacred ocean of consciousness. Mark Johnson’s work at N Space is a well of psychological fodder, a trip into the “Mind of The Artist” and a sincerely well-considered body of work which, although slightly disturbing, exhibits an overwhelming and intoxicating decadence of material and composition.